It may only be October, but we know you’re making your lists and checking them twice! And we don’t blame you! Saving for those that must-have gadget this season or preparing your holiday feast means every dollar counts. Luckily Swagbucks has you covered – from helping you earn cash and gifts card for your holiday purchases, to sharing exclusive insights on gifting trends and more. Today, we released our findings from our 2016 Holiday Shopping survey. We uncovered everything from children’s wish lists to the least desired Christmas gifts. And surprisingly, Aunt Delores’ fruit cake didn’t make the list! According to the our findings, clothing is at the bottom of wish lists as the least desired gift. And make sure to double check that shopping list for your kids, as 45% of respondents plan to spend the most on their children in comparison to their spouse (26%), parents (15%), or siblings (7%). The survey also revealed that the majority of parents (40%) who receive “Dear Santa” wish lists from their children will receive them before November. In the spirit of the season, 56% of those parents write back as Santa. No big budgets for the boss this year! 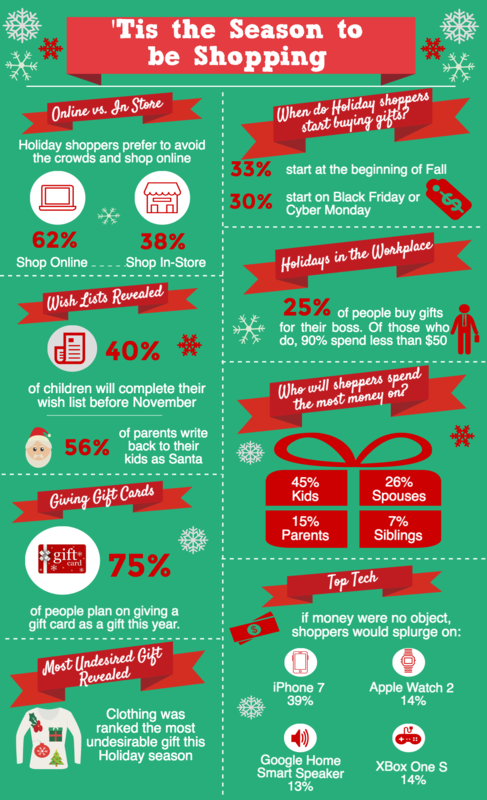 Check out our infographic here for more insights on the 2016 holiday shopping season!